The 2007–2014 Index pulls together data from a multitude of sources and compares year on year figures for 20 key indicators (from public participation to West End revenues). Welcome to the Arts Index 2015, produced by the National Campaign for the Arts. The NCA is the only organisation that campaigns for an increase in arts funding. We hear everywhere about “difficult decisions” in public spending. The NCA believes that the important word in that phrase is “decisions”. We do not accept that public sector cuts are inevitable. Other countries (France, Germany, Sweden, for instance) have decided, despite financial hardship, to increase the proportion of public spending they give to the arts. When this country introduced the NHS and the Arts Council in the 1940s, it was broke. But the money was found, and those two organisations remain proud examples of what can be done with political will. The NCA believes that art is not an add-on, not a “nice-if-you-can-afford it”. Arts spending is part of the solution, not the problem. The difficulties of which we hear so much – poverty, alienation, radicalisation, inequality, truancy, ill-health – are all things the arts can improve. We believe that a co-ordinated arts policy should see the arts as an essential part of everyday life. 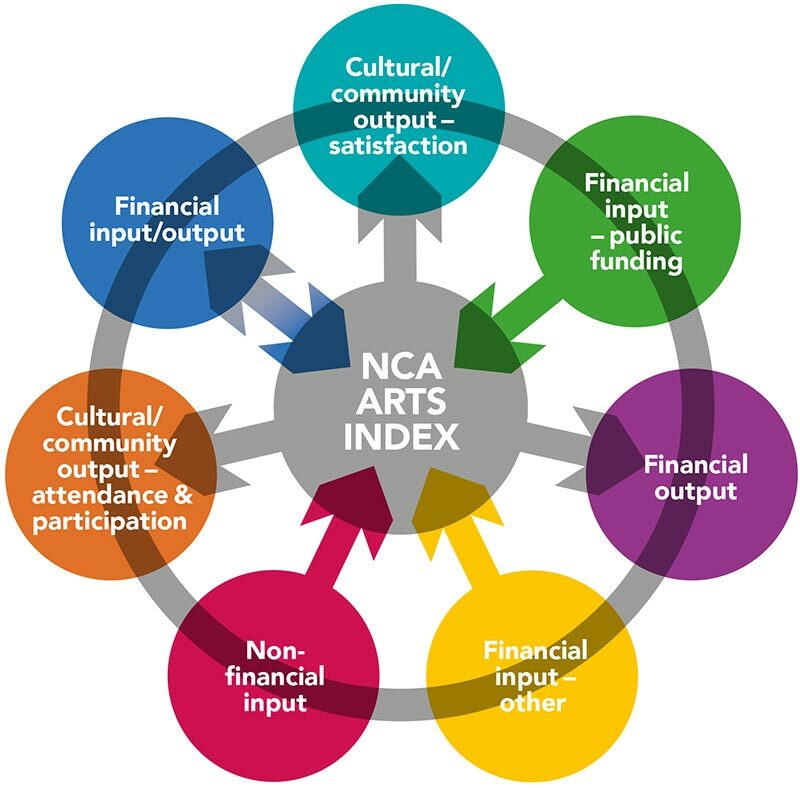 The NCA publishes the Arts Index as a health check of the arts in this country. Of course art can never simply be reduced to a set of figures; assessing the health of any organism is complex. But policymakers need to know what’s happening. They need independent and objective information. The Arts Index provides it. The way the arts are funded in this country is changing. Welcome initiatives like tax breaks must be set against big falls in public investment. Our arts sector, arguably the most efficient in Europe already, is having to rely more and more on earned income rather than public funding. What effect is this having on the size and economic impact of the sector? More than ever, the Arts Index is needed to track those changes. The 2015 edition (including new data for the years 2012/13 and 2013/14) has some positive news for the arts in England as well as some serious causes for concern. 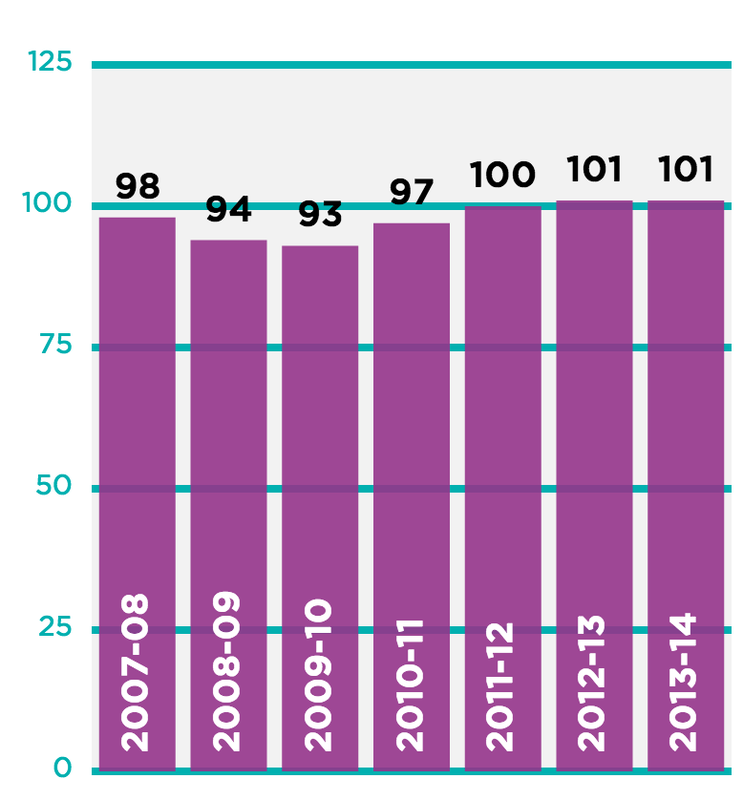 When we last published the Index for England in 2013 the overall Index figure had reached an all-time high: 110. 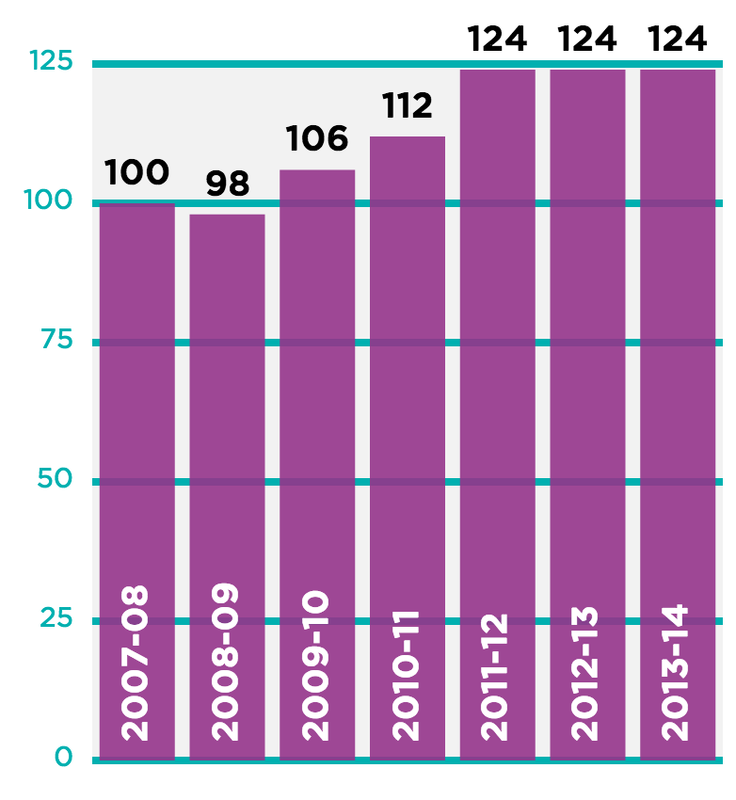 We can now reveal it rose again to 115 in 2012/13 before dropping to 111 in 2013/14. Treasury funding down. This edition shows a large fall of 13 points. 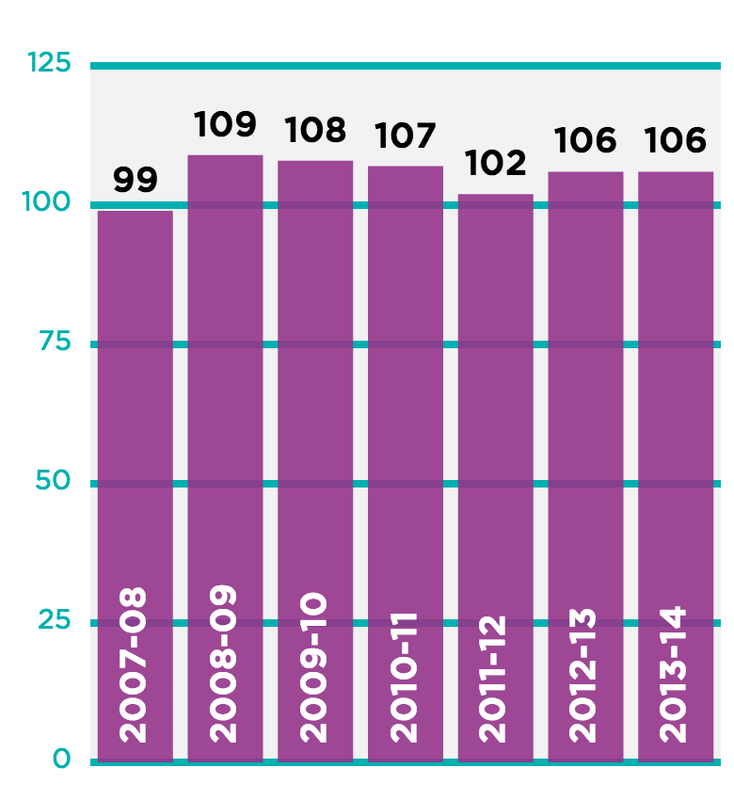 Since the Index began in 2007/8, Treasury funding in England has fallen in real terms by a third. Local government funding down. Local government funding continues to fall and is down by four points in this edition. 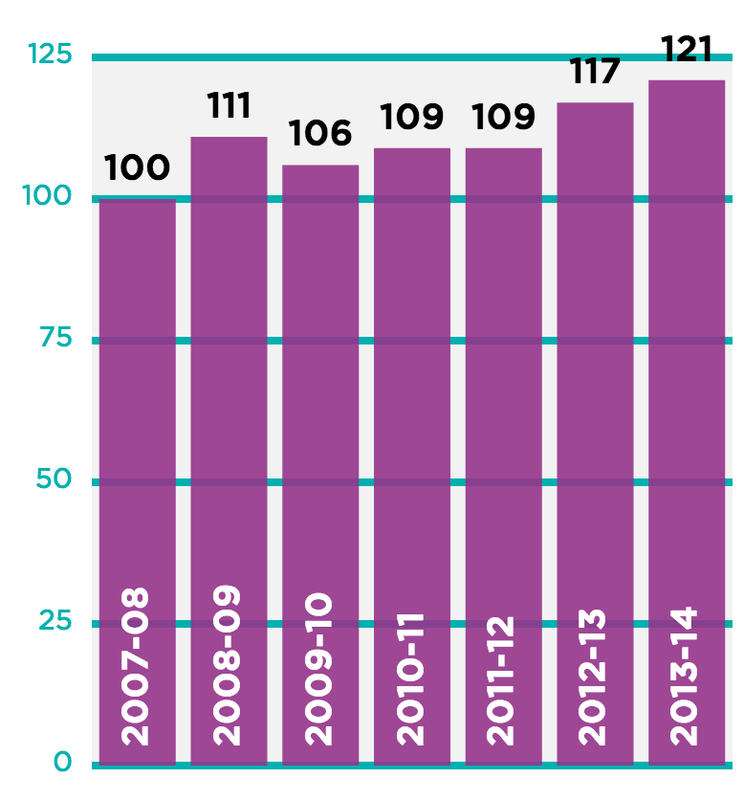 Since the Index began in 2007/8, local government funding has fallen by a quarter. Combined public funding down. A fall of seven points in this edition. Since the Index began in 2007/8, total combined public funding (Treasury, local government and Lottery) has fallen by a fifth. 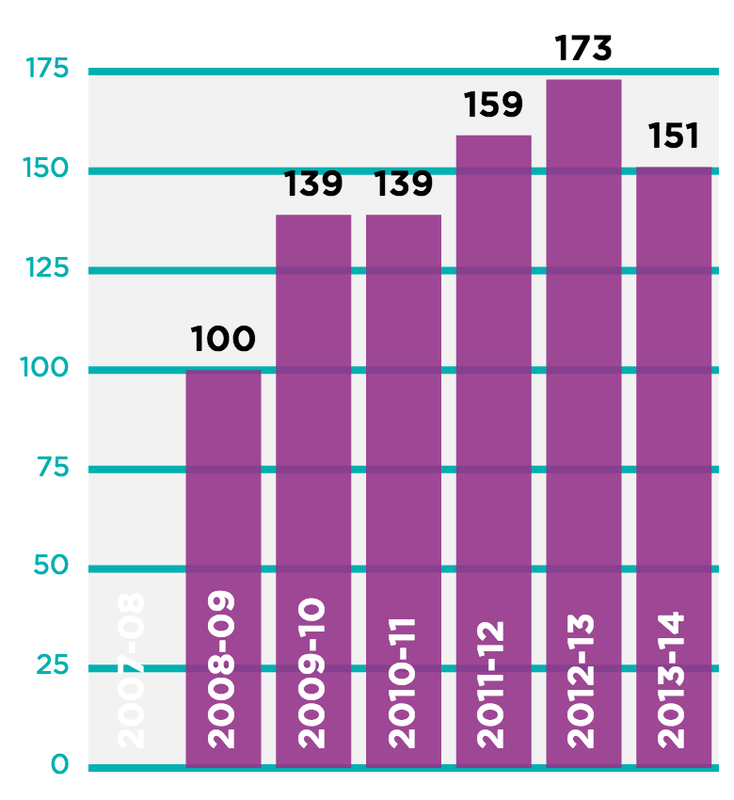 A major influence on the overall Index is changes in Lottery funding; there was a particular spike after the end of Olympic funding in 2012/13. Other indicators that have helped to push the overall Index up show how well the arts are surviving in a tough financial climate: earned income by arts organisations, employment and contribution of the arts to the overall economy all increased by over 10% in the last two years. 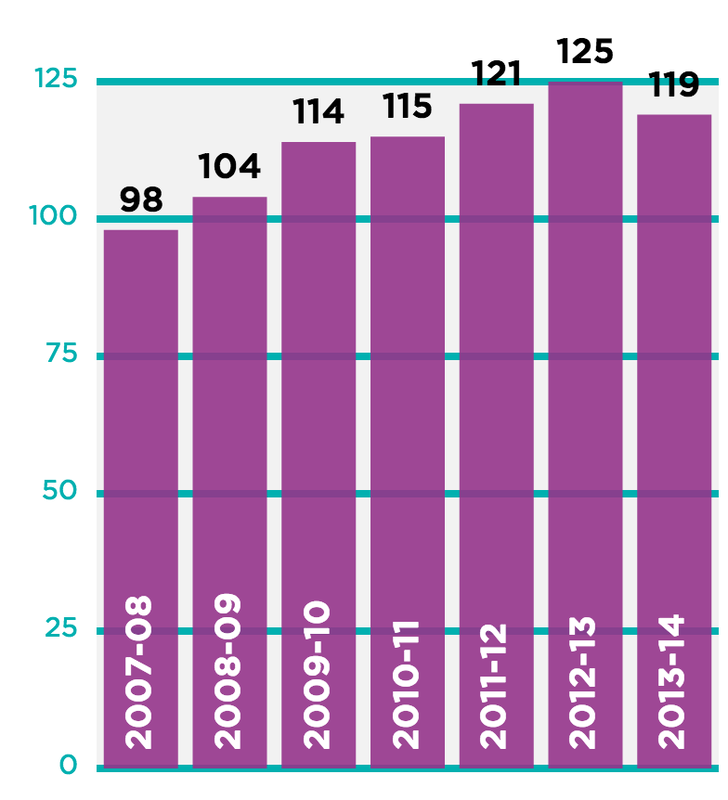 Against these encouraging increases must be set some worrying decreases, including a big fall in the unrestricted reserves of arts organisations (down 17). In the last Index we said that the Arts Council England’s attitude to Lottery funding seemed to be changing. Their challenge had been to maintain the principle of additionality: that Lottery funding was a very nice ‘and’, but it mustn’t become an ‘or’. While in the past Arts Council England still seemed to believe in additionality in theory, in practice treasury funding was falling so much that upholding the principle would force Arts Council England to withdraw funds to some arts organisations, which would close. As a result we suggested that some of Arts Council England’s National Portfolio Organisations might become wholly supported by the Lottery. We were right: from April 2015 some of Arts Council England’s core portfolio will become 100% reliant on Lottery funds. Given the size of Treasury cuts this seems pragmatic, but it leaves the sector vulnerable: we know from past experience that lottery income can vary hugely depending on the mood of the people. In the Index we give equal weight to all twenty indicators: income from West End theatre has the same importance as the percentage of adults attending arts events, for example. This means that we treat changes to the three main sources of funding for the arts (national Treasury, Lottery and local government) as being of equal importance. This isn’t the case. National treasury funding and local government funding were the biggest sources of income to start with; they have fallen, while only the smallest source of funding (National Lottery) has risen. Overall, funding for the arts has fallen further and faster than ever before in this country. Increases in earned income have been helpful in replacing public funding over the last two years. Faced with a need to earn more money, organisations raise their ticket prices. But this can’t continue for ever – the amount people are prepared to pay for a ticket is limited, and so is the number of seats. The NCA believes expense is one of the greatest barriers to access; before long, rising ticket prices alienate the very audiences you wish to attract. About private giving, we are unable to comment: we have no new figures. Arts & Business used to conduct an annual survey of arts and cultural organisations to find out how much money they were raising from individuals, companies, and trusts and foundations. Since Arts & Business lost their Treasury funding, the survey has not been done; we have had no new data for the sector as a whole since 2011/12. We think it’s ridiculous that a government arts policy based on philanthropy is no longer able to measure levels of philanthropy, and we call for the immediate reinstatement of this data collection. Arts Council England produces annual figures for its National Portfolio Organisations. These do show a growth in ‘contributed’ income, but this increase in income is almost matched by increased expenditure on fundraising activities. The arts sector has survived, and arguably thrived, over the last five very tough years. From one angle, the new Index paints a picture of the arts looking lean and fit. From another, they seem thin and fragile, stretching a working culture based on goodwill, and on the cusp of serious and irreversible damage from national and local cuts to funding. Audiences are still coming in huge numbers and paying more, but how can this trend continue if the nation tightens its belt once more? We hope you find them, and the Index itself, provocative and useful. In this new edition of the Index, each of the NCA’s Directors has contributed reflections on some of the indicators. These are meant to put some flesh on the bones of the Index’s bones; we don’t pretend to be able to predict the future but wanted to express our hopes and fears. The comments are personal and do not necessarily reflect the views of the NCA Board as a whole or of the organisations we work for. ‘A measure of the value of a variable relative to its value at some base date or state’ – The Oxford Dictionary of Statistics. An index allows us to understand how something being observed has changed. 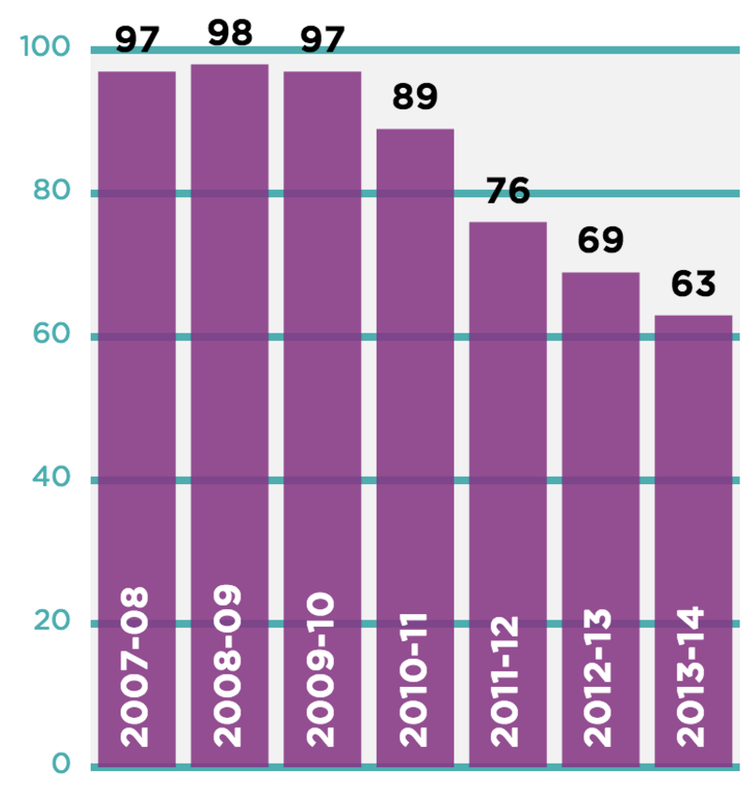 In the Arts Index, this change has now been measured over a seven-year period. Why don’t the indicator tables begin from a base of 100 in this edition? 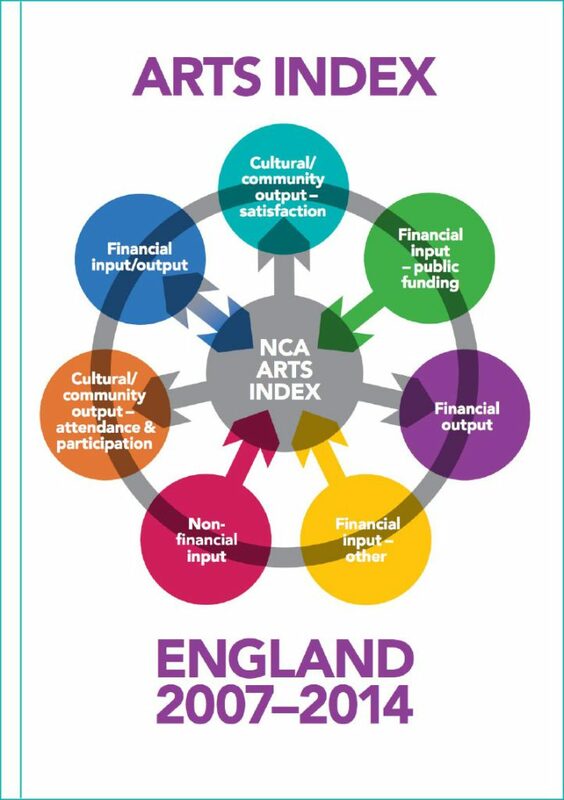 The original NCA UK Index was based on data compiled from Wales, Northern Ireland and Scotland as well as England. This was used in 2007/08 to establish our baseline to measure change over time and to show the differences between each of the four UK nations. This edition of the Index only covers England, but we have continued to use the UK baseline as our starting point. For that reason, many of the indicator tables do not (as might be expected) have a starting point of 100. For some of the indicators we do not have good quality data for England but we do for the UK as a whole. Whenever this is the case, it is clearly marked. 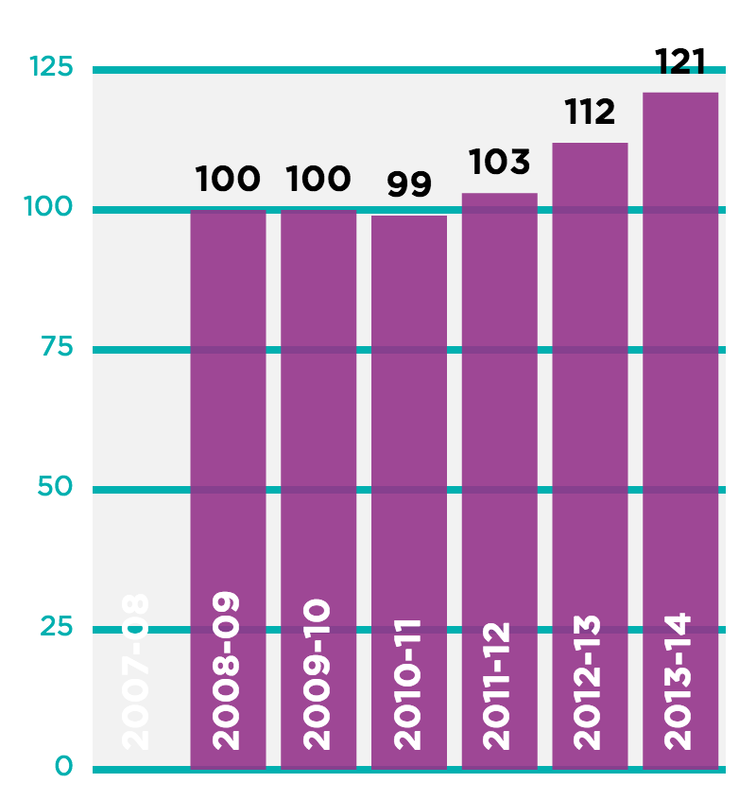 The first UK Arts Index covered three financial years from 2007/08 to 2009/10. It brought together a number of different sources of information, in a way that allowed comparisons to be made between these years across the English regions, across the four nations and across the UK as a whole. There are twenty separate indicators that feed into the Index, each of which has been chosen because it gives us insight into the health and vitality of the arts sector. The indicators are grouped together into seven categories. The diagram on the previous page shows the relationship between these different financial, economic, cultural and community inputs and outputs. The earliest year available for the data is the base year. In most cases this is 2007/08. If data is available from an earlier year but gaps exist in later years then the data has been brought forward to fill the gaps. This keeps the Index as comparable as possible across the years. We aspire to use the most accurate and appropriate data possible in the Index. This means that when new datasets are available or when data providers revise their figures we will update the Index with the improved figures. This means that some of the figures in this Index do not exactly match those in previous editions and it is highly likely that the figures in this publication will be refined in future editions. Population at each geographical level has been taken into account so that areas can be compared ‘like for like’. The research for this updated English edition of the Index has been produced by NCA volunteers steered by David Brownlee, who as the former Chief Executive of Audiences UK led the work on the original Index. The original Index reported across the four UK nations as well at a regional level in England. The NCA aspires to produce the Index in this level of detail in the future, but requires additional financial resources to do so. It is hoped that a revised version, covering the UK, can be released later in 2015 or 2016. The original Index showed regional data, and highlighted the big discrepancy between London and the regions (Treasury funding of £1.89 in the East of England, for instance, compared to £22.43 in Greater London). Data for the nine English regions are no longer published by the Office for National Statistics and Arts Council England, so regional reporting is not possible after 2011/12. We see this as regrettable, and hope that the publication of the Arts Index will be part of the drive to reintroduce this data collection. We are aware that interest in this Index won’t be limited to people who are embedded in the world of arts and culture funding and policy. For that reason we have included a glossary, including explanation for some of the terms and acronyms used throughout the Index. The overall Index for England has increased every year except for 2010/11 and 2013/14. While overall changes across the 20 indicators have been slight, there have been major fluctuations in many individual indicators. Note: indicators for which no new data has been published in the past two years (5, 6, 7, 16) are not included in this summary table. Indicator 9 is also excluded as it is based on a sample where statistically insignificant changes may have a large impact on the index scores. In England the cumulative amount per person invested from these three sources continued to grow until 2009/10, when it reached an inflation adjusted figure of £19.64 (boosted by Arts Council England Sustain funding). It then fell by almost £2 to £17.68 in 2010/11 and then a further £1.26 to £16.42 in 2011/12 before rising 89p back up to £17.33 in 2012/13 only to drop £2.34 to a new low of £14.99 in 2013/14. The decline in this indicator, from 97 when the Index began, to 63 in 2013/14, is the largest fall of any indicator in the Index. The score is based on money per person per year. The 2007/08 baseline was calculated by taking Grant in Aid figures from the annual reports of all four of the UK’s national arts councils, divided by the population for each nation in that year (based on UK National Statistics). Financial values stated are adjusted so that they are comparable with 2007/08 prices, using the Consumer Price Index. It should be noted that this does not represent the entirety of national government investment in the arts in England as Department for Culture, Media and Sport makes direct grants to a number of institutions. It is unforgivable that the biggest cut in income comes from the Treasury - even hard pressed local authorities overall have cut less than the government. The severity of the cut of almost half the budget of the Arts Council was a policy decision, not even the fair share of austerity measures. 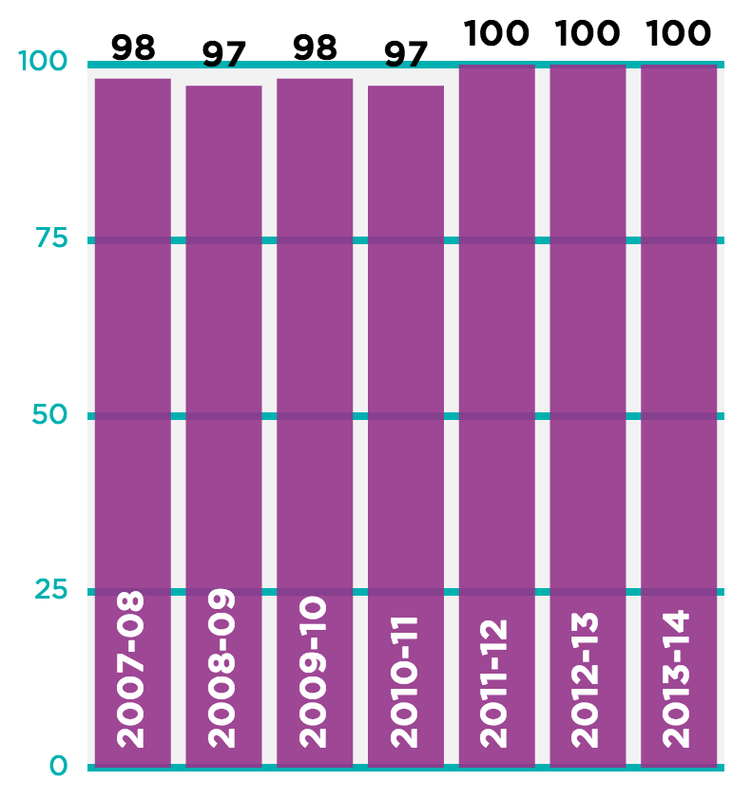 There is large variation across the years; this comes partly from differences between when awards from major funding programmes (including capital programmes) are announced and when they are spent. Recent growth is largely due to Lottery funding of the 2012 Olympics coming to an end and a shift in government policy to increase the proportion of Lottery funding being allocated to the original good causes, including the arts. The extraordinary figures in 2012/13 were in part due to a number of capital awards. 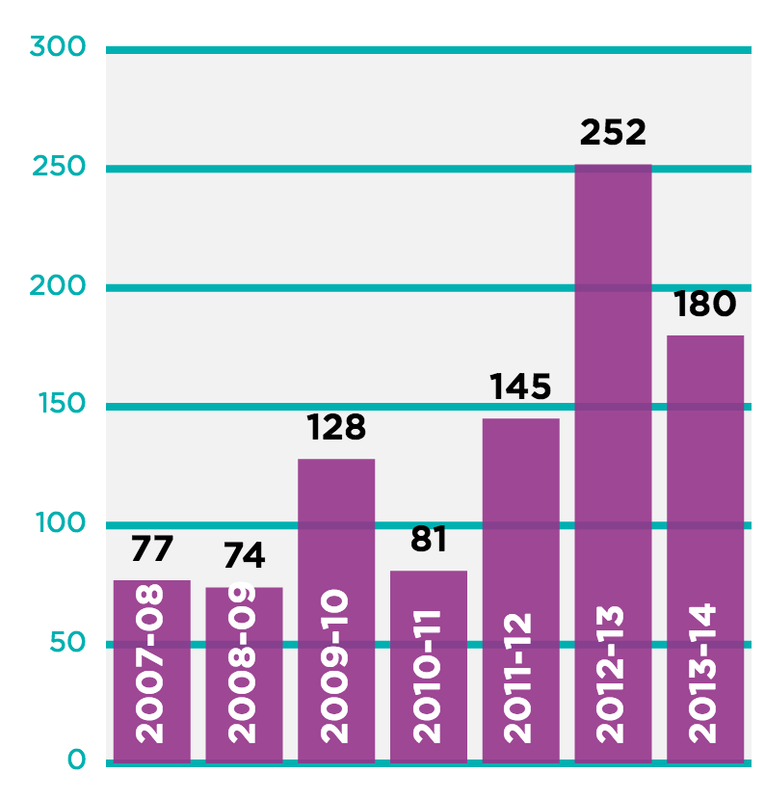 The reduction in awards in 2013/14 may in part be due to the start of a trend of falling Lottery receipts. The growth in Lottery funding remains one of the most positive stories for the arts in the last five years and it is the indicator that has increased most of the 20 used to calculate the overall Index. Data for this indicator has been taken from the Department for Culture, Media & Sport (DCMS) Lottery database, and includes arts grants made by all distributing bodies, not just the arts councils. There is some variation in the figures in the original Index because some grants are geographically specific and others UK-wide. To maintain consistency, the only figures included for England in this report are those that the database tags to a specific area. This is one reason why the figures in the Index cannot be compared to the amount of Lottery funding reported as distributed in Arts Council England’s annual reports. It should also be noted that the DCMS Lottery database reports on when a grant is offered, not when the money is spent. 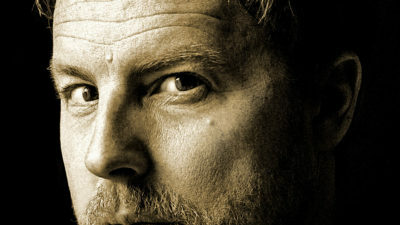 For some programmes there may be a lag of several years between the award and use of funding. Anyone who cares about the arts will be delighted that the government has refocused Lottery funding back to the original ‘good causes’. Lottery funding is now vital to the health of the arts in the UK. Government controls how much is distributed but it can’t control how many tickets are sold. An economic recovery is likely to mean fewer people buying Lottery tickets and therefore a cut in funding to the arts. Can this be right? 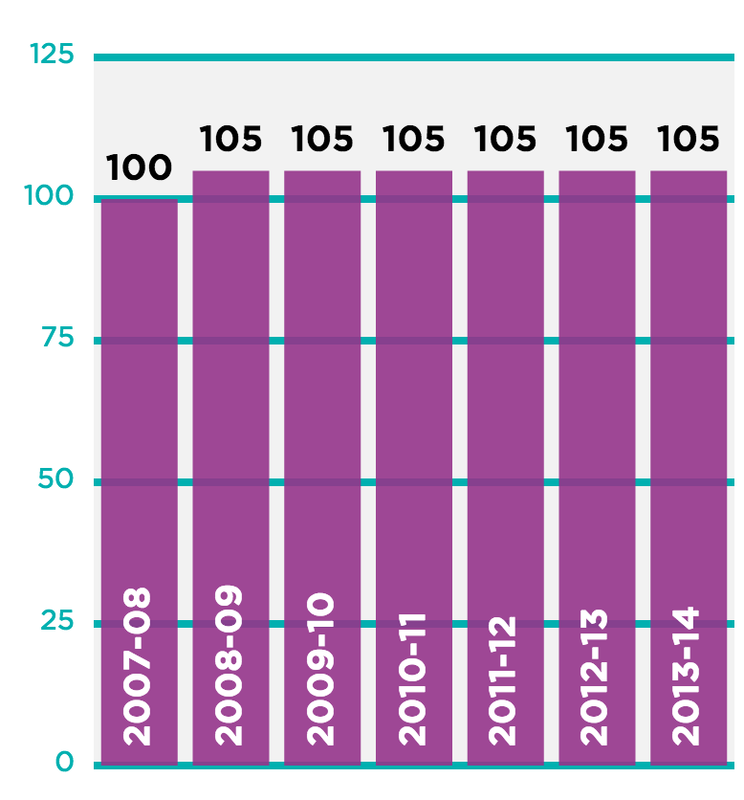 Cumulative local government funding for the arts in England rose until 2009/10 when it dropped from an inflation adjusted £9.59 per person per annum to £9.29. There was a further steeper fall to £8.77 in 2010/11 and a steeper fall still to just £7.53 in 2011/12. 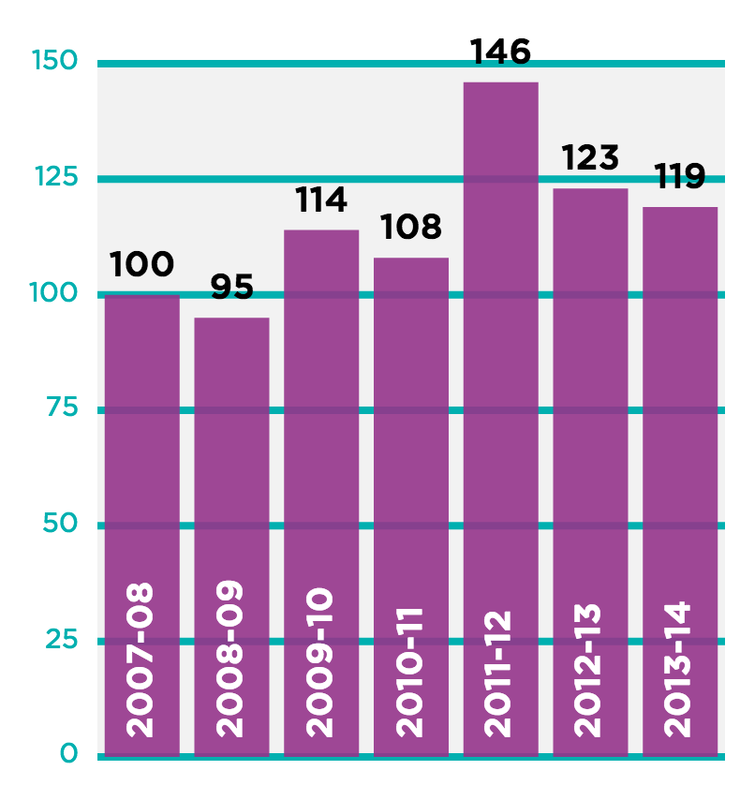 Falls have been smaller in 2012/13 and 2013/14, but these have still been disproportionate compared to cuts required across all service areas. England: arts development and support / museums and galleries / theatres and public entertainment. Scotland: museums and art galleries / other culture and heritage. Wales: museums and art galleries / arts development and support / theatres and public entertainment. Northern Ireland: arts development and support. In all cases we used the net expenditure, excluding capital charges to calculate the baseline and annual changes, dividing this by the population numbers in that year. Figures for Scotland were higher because they include all culture and heritage spending, not just arts spending. The slowing of cuts by local government to arts funding in the last two years should not bring false hope. Pressures continue to grow on Town Halls up and down the country and the long history of local government providing support for cultural activities in their communities will be increasing threatened if the Spending Review after the 2015 General Election brings more cuts. The combined score is worked out by adding together the income in England per head for each year across indicators 5, 6 and 7 and comparing it to the 2007/08 figure for the UK (we do not include indicator 4 in this summary as it relates just to Arts Council England revenue funded clients). During the baseline year (2007/08) England outperformed the rest of the UK in this category, with a combined total of £12.09 per person. Adjusting for inflation, this fell for the following three years. 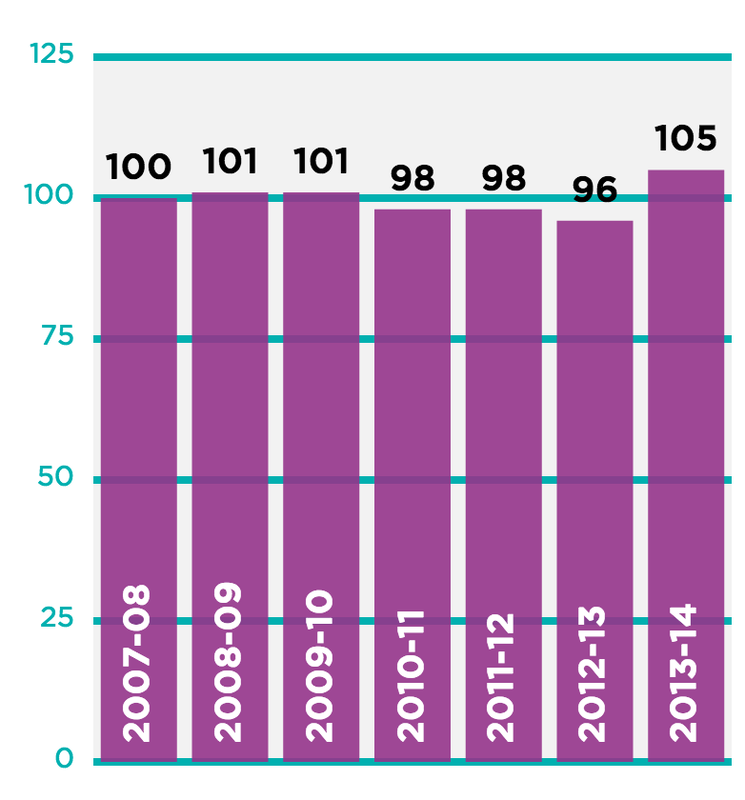 In 2011/12 there was a small increase from £10.60 to £10.89 largely thanks to an increase in income from Trusts and Foundations. Arts & Business has ceased to carry out its annual survey of private giving to the arts so we therefore have no new figures for 2012/13 and 2013/14. ‘Earned income’ represents box office sales and venue hires along with secondary income from bars, catering, merchan-dising etc. 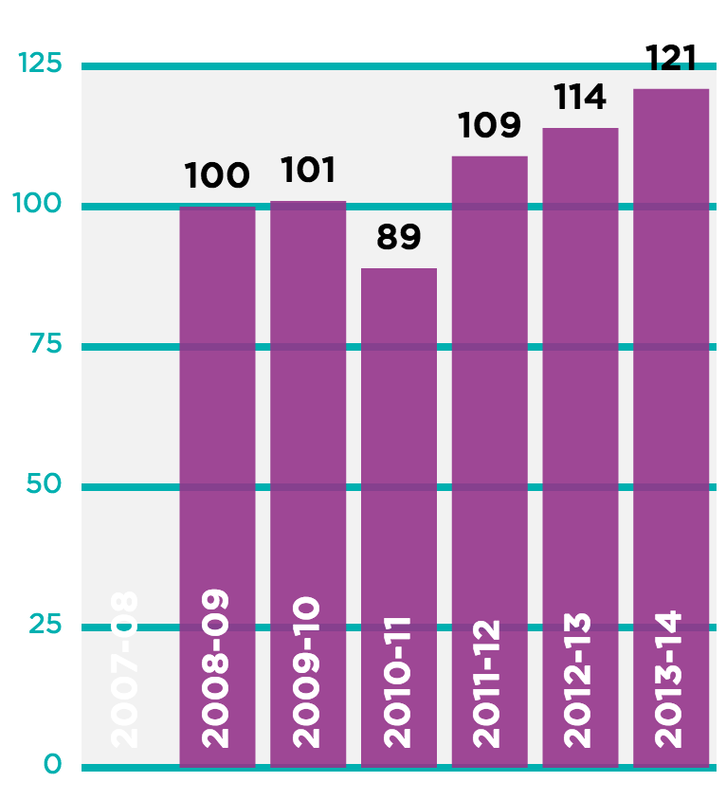 Despite the challenging financial climate, the Index has continued above 100 for the last four years. Using inflation adjusted figures, in 2011/12 the amount of earned income per person for revenue funded organisations in England was £10.07 compared to £9.34 in the baseline year. 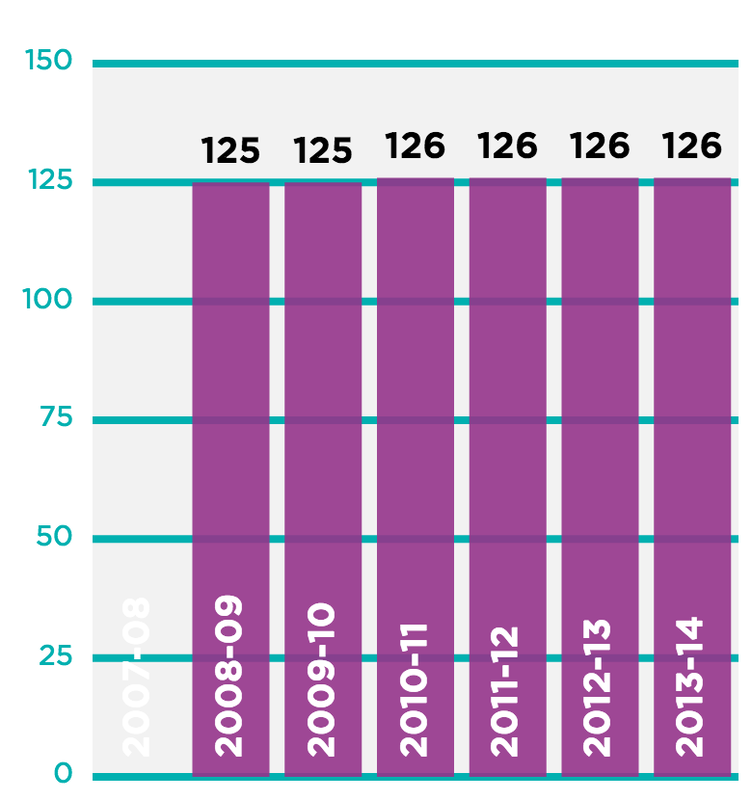 This data for establishing the 2007/08 baseline was only available for England (from Arts Council England) and Northern Ireland (from Arts Council Northern Ireland). In both cases the figure used was the entire earned income reported for all revenue funded organisations in the given year. This was then divided by national population numbers for that year. At first sight, arts charities increasing earned income to replace lost grants may seem like a good thing. But how is this increased income being generated? If ticket prices are going up, are the arts becoming less affordable for some families? If room hire rates are increased, will some community groups be excluded from cultural provision? More research is needed in this area to ensure a more ‘efficient’ arts sector is not also becoming a more elitist arts sector. The inflation adjusted decline in business contributions to the arts in England continued throughout the first five years of the Index. 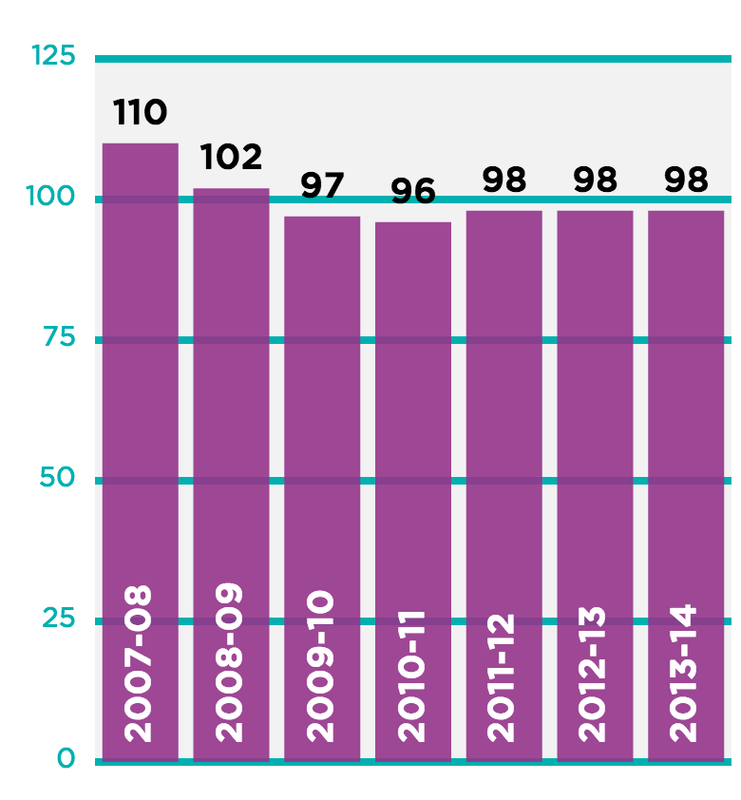 The drop in 2011/12 was in fact the smallest to date, but despite government initiatives to encourage greater sponsorship the sector had seen a 30% drop in five years. The per person figure fell from £2.70 in 2007/08 to a low of £1.88 in 2011/12. Arts & Business lost its revenue funding from Arts Council England and has not conducted this annual survey since 2011/12 and we therefore have no new data to use to update the Index for the past two years. The data for establishing this benchmark came from Arts & Business’ Benchmarking Tool for the UK, dividing the overall figure by the UK population. This data refers to contributions made not just to the arts, but also to heritage, libraries and archives. Increasing Sponsorship was a big priority for this Government. How have they done? We don’t know. It is crucial that the work to monitor trends in Private Investment previously undertaken by Arts & Business continues. When the Index began in 2007/08, business contributed more to the arts and culture in England than trusts and foundations (business £2.70 per person, trusts and foundations £2.52). That position reversed in 2009/10 (business £2.18 per person, trusts and foundations £2.46) and a substantial gap grew between the two by 2011/12 (business £1.88 per person, trusts and foundations £2.87). Arts & Business lost its revenue funding from Arts Council England and has not conducted this annual survey since 2011/12 and we therefore have no new data to use to update the Index for the last two years. Trusts and foundations were playing an important role in stabilising the sector in the face of cuts to national Treasury funding, local government funding, sponsorship and individual giving. With pressure on the value of investments, it is questionable whether this growth has continued in the past two years. The data for this benchmark came from Arts & Business’ Benchmarking Tool for the UK, dividing the overall figure by the UK population. As before, this data refers to contributions not just to the arts but also to heritage, libraries and archives. As other sources of funding retreated, trusts and foundations seem to be filling important gaps. Was this a short term effect or are trusts providing sustainable long-term support of organisations and events? Without the data since 2011/12, we can’t say. Throughout the first five years of the Index, cumulative individual contributions in England were greater than the figures for business and trusts and foundations combined. After a major drop from £6.27 per person in 2007/08 to £5.38 in 2009/10, fortunes in this area seemed to have stabilised and begin to improve in 2010/11 and 2011/12. This period saw increased government-led encouragement of philanthropy and the launch of new funding schemes to support arts organisations in this area. The data for establishing this benchmark came from Arts & Business’ Benchmarking Tool for the UK, dividing the overall figure by the UK population. As before, this data refers to contributions made not just to the arts, but also to heritage, libraries and archives. Large sums have been invested to develop arts organisations’ work to increase support from individuals and corporates. For the year 2013/14 across Arts Council England’s entire national portfolio an impressive £180 million was generated from ‘Contributed Income’. However at the same time £245 million was spent on ‘Generating funds’ including £155 million in staff costs. Let’s hope that rather than acting simply acting as an expensive job creation scheme, this significant investment will deliver far more sizable rewards for hard pressed arts organisations in the future. Because of concerns about the quality of the data for volunteering a summary table is not included in this section. We are getting a clearer picture of the impact increased tuition fees are having on the numbers studying creative arts subjects. Our indicator covers all students, not just first years. Change in the Index is therefore gradual as the declining number of new starters has a proportional impact on the figures. The steady decline in these overall figures since 2011/12 masks a huge drop in first year numbers in 2012/13 and only a partial recovery in 2013/14. Figures released by the Higher Education Statistics Agency (HESA) show that creative arts and design have performed comparatively worse than most other subject areas in growth of first year students since 2007/08. These figures come from the Higher Education Statistics Authority and include student numbers for the following subjects:Programmes broadly-based within the creative arts and design / fine art / design studies / music / drama / dance / film and photography / crafts / imaginative writing. The fear in the arts community that the numbers studying creative subjects at university is in decline appear to be being proved right. Many are worried that the arts will only be an option for those who can afford to take on major debts and then work in an area where pay can be low. Are we entering an era when the arts do become truly elitist? Whilst previous indicators are able to draw from specific numbers (such as the known number of higher education students), this indicator is based on an estimate using a representative sample of the English population. Sampling in this way always leaves a margin for error. 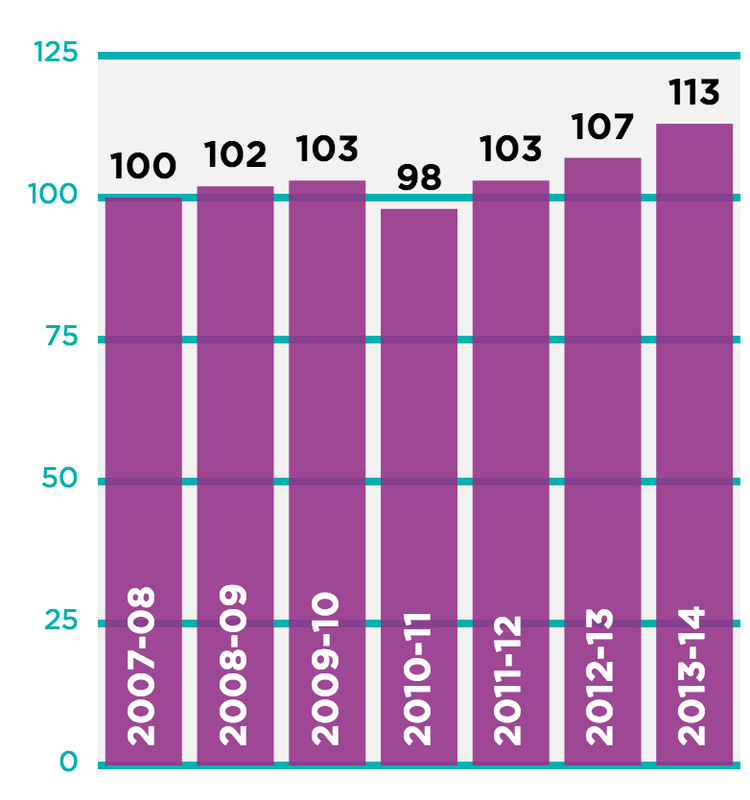 The Index suggests there was a 46% rise in adult volunteering in the arts in England from 2007/08 to 2011/12 and then a fall in 2012/13 and 2013/14. However as the 46% change only amounts to 0.8% of the adult population (1.7% in 2007/08 rising to 2.5% in 2011/12), it may not be a statistically significant change when margins of error are taken into account. This is the first Index that covers the period of the 2012 Olympics and Cultural Olympiad. There does not appear to be a major or sustained increase in the levels of adults volunteering in the arts. This data has comes from the Department for Culture, Media and Sport’s Taking Part survey. Figures have only ever been available for England. Despite all the caveats about the data on volunteering, one thing remains very clear: while the vast majority of adults attend and/or participate in the arts, very few volunteer. Could we do more to encourage volunteering in the arts? Reserves are a good way of measuring arts sustainability. The improved data source for this indicator shows an increase in the first five years of the Index until 2011/12. Levels of unrestricted reserves have decreased in the last two years but remain higher than they were in 2010/11. We are grateful to Arts Council England for sharing previously unpublished figures for ‘unrestricted’ reserves for a constant sample of their National Portfolio Organisations (previously Regularly Funded Organisations). The total has been divided by the population of England in each year. In previous editions of the Index we used the entire combined reserves reported for all Regularly Funded Organisations in any given year. These included ‘restricted’ funds, designated for particular projects and programmes (including capital projects) that the organisation could not use in any way it chose to do. Looking at this new data for unrestricted reserves shows how prudent arts organisations were in the early stages of the economic downturn. However we have seen significant dips in the overall level of reserves in the last two years. This could threaten the resilience of individual organisations and the sector as a whole. The combined score is calculated by adding together and averaging the individual indicator scores for each year. The year-on-year rise until 2013/14 was largely due to the ongoing increase in those digitally attending or participating. 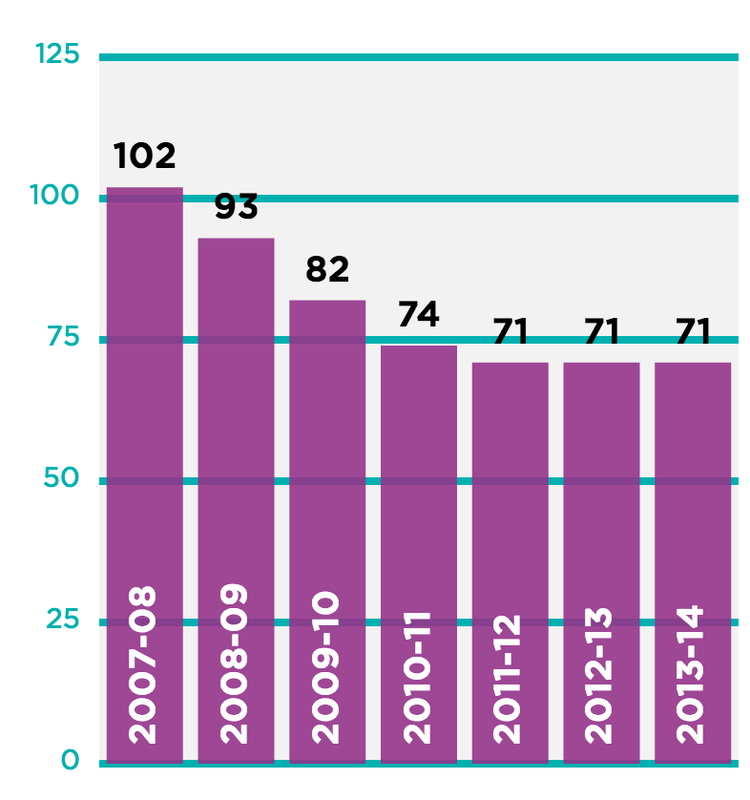 Around 67% of adults in England reported attending an arts event in the years from 2007/08 to 2010/11; a small increase to 69% was reported for 2011/12 and very similar figure was recorded in 2012/13. The figure for 2013/14 had yet to be released by Department for Culture, Media and Sport at time of going to press, but a combined figure for adult attendance and participation (‘arts engagement’) showed no statistically significant change. 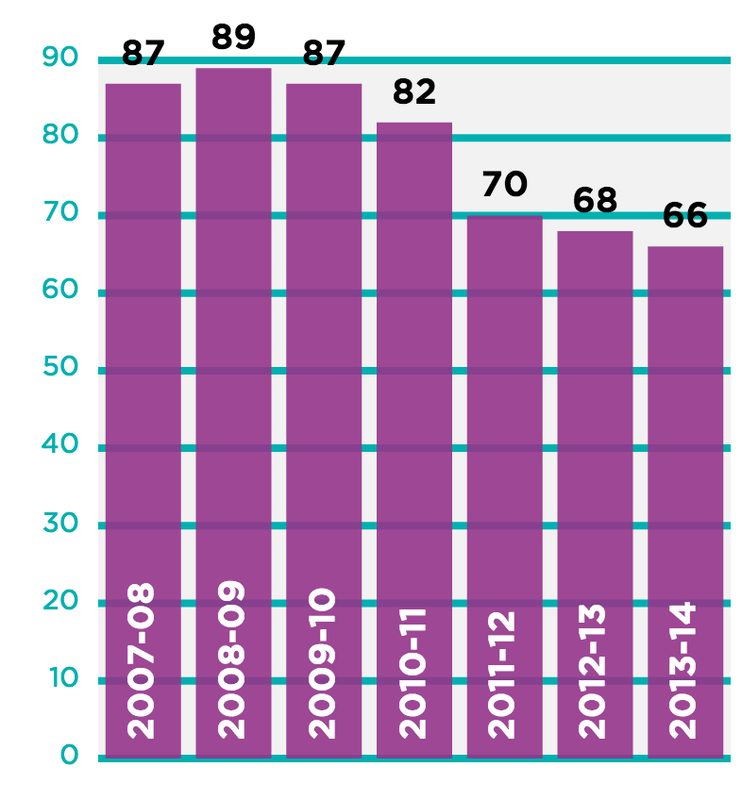 The figures used to establish the 2007/08 baseline were from the Department for Culture, Media and Sport’s Taking Part Survey in England, and from the arts councils in other nations. The total number of adult attendances across the UK was divided by the adult (16+) population for each year for each nation. It should be noted that there is no common definition of what constitutes an arts activity across the four UK nations, so variations in levels of engagement between the nations cannot be accurately measured. The definition in England was more narrow than in the other UK nations, which may be the cause of England only scoring 98 in the baseline year of 2007/08. Despite the ongoing economic challenges, it’s great to see more people than ever attending arts events in England. The public continue to be the biggest funders of the arts, largely through buying tickets. 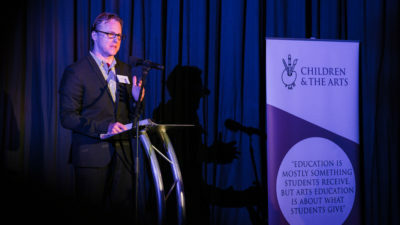 The UK has an international reputation for the quality and creativity of its arts marketing and audience engagement and this has played a significant role in attracting a larger and more diverse audience to the arts. The small dip in adult participation in the arts in England in 2008/09 and 2009/10 was reversed in 2011/12 and was reported to grow a further 0.7% in 2012/13: 48.8% of adults said they participated in an arts activity at least once a year. The figure for 2013/14 had yet to be released by Department for Culture, Media and Sport at time of going to press, but a combined figure for adult attendance and participation (‘arts engagement’) showed no statistically significant change. 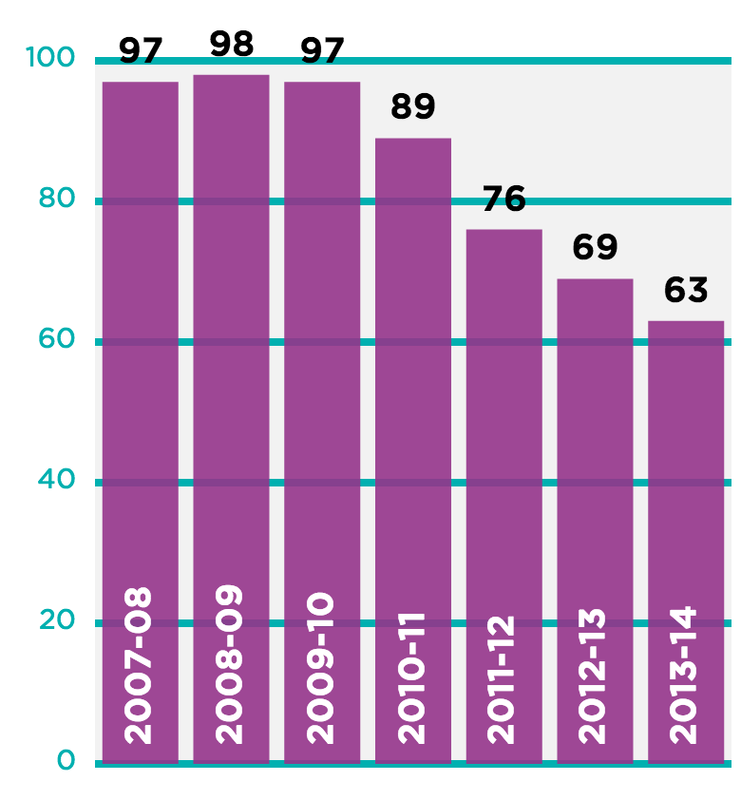 The figures used to establish the 2007/08 baseline were from the Department for Culture, Media and Sport ‘s Taking Part Survey in England, and from the arts councils in other nations. The total number of adult attendances across the UK was divided by the adult (16+) population for each year for each nation. It should be noted that there is no common definition of what constitutes an arts activity across the four UK nations so variations in levels of engagement between the nations cannot be accurately measured. The definition in England was more narrow than in the other UK nations, which may be the cause of England only scoring 98 in the baseline year of 2007/08. The arts don’t simply provide flexible and rewarding employment. A nation’s artwork provides it with a rich and often highly attractive identity in the wider world - it helps nations to be understood on the widest possible scale. Within any country, art can allow communication between individuals and groups of all kinds - it is the underpinning to any real social cohesion and to any genuine democracy. And the products of artists are, almost by definition, something which enrich a culture and bring joy to individuals and groups. It would always be my hope that the UK would understand and support the role of its arts and a matter of grave concern that support, training and facilities for the next generation of artists are now failing and that access to the arts is being reduced. That failure will affect us all. 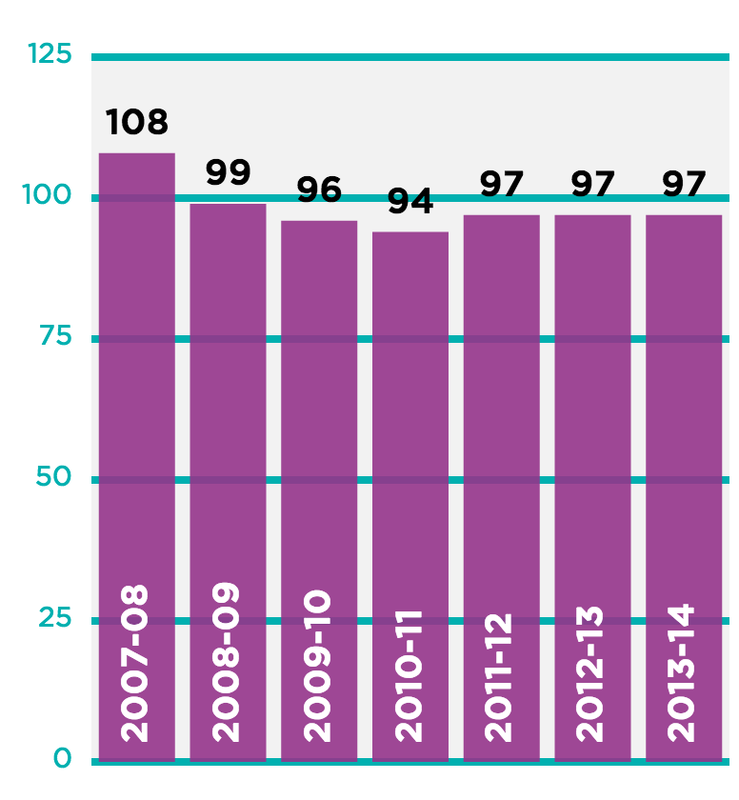 In England the number of children reporting they are attending or participating in arts activities at least once a year rose from 98% in 2007/08 to 99% in 2011/12 and has continued at this level for the following three years. Only limited data was available in 2007/08, so 2008/09 was used as the base year for this indicator. This is why there is no score shown in the graph for 2007/08. The data used for the 2008/09 baseline came from a number of sources and is only available for England, Wales and Northern Ireland. English data comes from the Department for Culture, Media and Sport’s Taking Part survey. Welsh data is from The Children’s Omnibus survey, produced by Arts Council Wales. Northern Irish data is from The Young Persons’ Behaviour & Attitudes survey, carried out by the Northern Ireland Statistics and Research Agency. 99% of young people in England taking part in the arts sounds impressive, but this doesn’t tell us anything about the quality or impact of that engagement. With the arts continuing to be squeezed in the curriculum and falling numbers studying creative arts at university, we cannot be complacent. The indicator is based on 2008/09 data because no 2007/08 data was available. The way this question was asked changed in 2010/11, which explains why the trend of significant annual growth paused. This indicator showed the greatest increase in the last edition of the Index and grew again by a further 10% in 2012/13 from 40% to 44%. Surprisingly, the figure fell back to 38% in 2013/14. Data for this indicator comes from Department of Culture, Media and Sport’s Taking Part survey, and is only available for England. It refers to the proportion of adults who have digitally participated in culture in each year. The way the question was asked changed in 2010/11, making accurate trend analysis impossible. Have the arts really woken up to the opportunities of the digital age? Do we match the creativity of what’s in our galleries or on our stages with how we engage with current and potential audiences online? Perhaps the recent fall in levels of on-line engagement is a signal that we need to up our game. While other elements of the Index look purely at input and output numbers, this section focuses on the impact for individuals, tracking the perceived quality of recent arts experiences and the satisfaction with local arts provision. Sadly, satisfaction with local provision is no longer measured: the most recent data we have is from 2008/09. This means it is not possible to give a meaningful summary chart for this section. In 2007/08, 57% of adults rated their most recent arts experience as ‘high quality’, increasing slightly to 60% in 2008/09. Arts Council England then ceased to publish this figure as part of their standard reporting. However, they have specially analysed more recent Taking Part data to give us new figures for Index. The figure rose to 63% in 2011/12 and to 64% in 2012/13. We do not yet have figures for 2013/14. The data comes from Department for Culture, Media and Sport’s Taking Part survey, and has only ever been available for England. The figure reported is based on a number of questions in the survey. Huge congratulations to the arts sector for increasing their earned income, keeping up their creativity and serving their communities, despite the cuts they faced. And even more important - huge congratulations on increasing the quality of their art, according to a record 64% of the adult population. This data has not been collected since 2008/09 so the last historic figure is used in the Index. While it was previously collected by Local Authorities, and could be used to assess levels of satisfaction down to Borough level, there is no reason why the question could not be included in another national survey (e.g. Taking Part) to track national trends now and in the future. The data for this indicator has only ever been available in England. It was originally collected through BVPI (Best Value Performance Indicator) surveys and then through the Place Survey. With so much pressure on Local Government funding and disproportionate cuts to the arts, we need now more than ever to track the public’s satisfaction with what is on offer culturally at a local level. The lack of current local satisfaction data means that many Councils are making decisions that are not properly informed by the views of their residents. The combined score is worked out by adding together and calculating the average indicator scores for each year. There were small increases in 2008/09 and 2009/10 before a five point reduction 2010/11. Since then the combined score has risen by between four and six points every year. This set of indicators reflects some of the ways in which the arts contribute back into the economy. The set is not exhaustive, but provides a balanced mix of indicators to monitor ongoing changes. The data suggests that the health of the West End has been relatively unaffected by economic downturn over the last five years, although when inflation is taken into consideration there was a small drop in income in 2010, 2011 and 2012 before record-breaking figures were achieved in 2013. Figures come from the Society of London Theatre, and refer to total revenue (including VAT) across all West End theatres. Figures are published by calendar year so 2007/08 relates to 2007, 2008/09 relates to 2008, etc. The Box Office performance of the West End seems to be on the rise. Many of the biggest shows of recent years began their life in the subsidised theatre. By cutting funding to the organisations that produced these shows, are we also cutting our national ‘R & D’ budget for one of the most important drivers of the UK’s visitor economy? For every £1 invested by Arts Council England in its regularly funded portfolio in England in 2010/11, a further £2.11 was spent by the arts organisation. In 2011/12 this figure increased to £2.49, but as the number of organisations being funded and the cumulative amount they were being funded decreased, the overall contribution to the economy of this portfolio decreased. 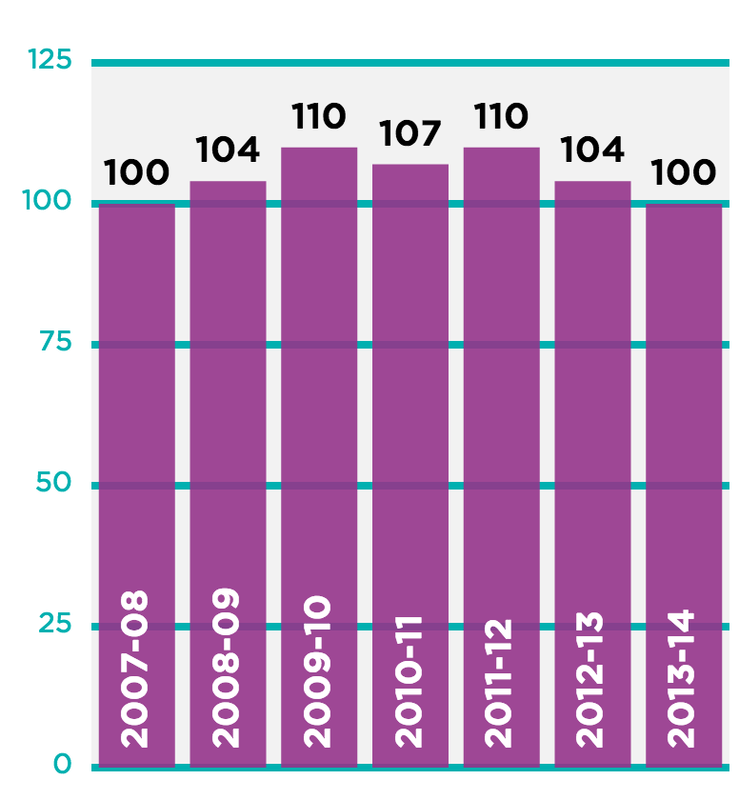 From a high of 109 in 2008/09, the Index in England dropped to 102 in 2011/12. 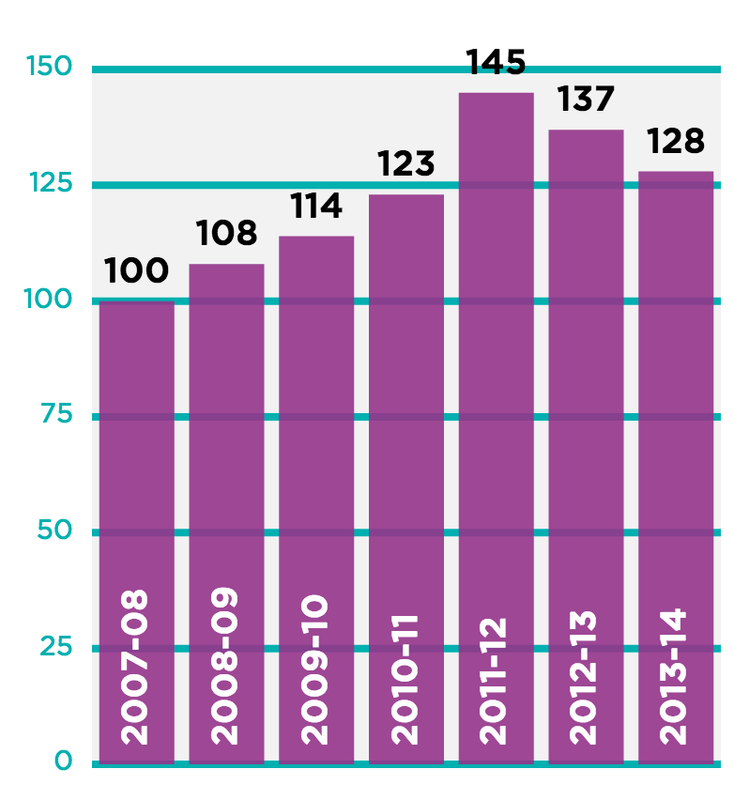 Encouragingly, the Index rose four points in 2012/13 and sustained this increase in 2013/14. The data to establish the 2007/08 baseline came from Arts Council England and Arts Council Northern Ireland. In each case, the figure used is the entire expenditure reported by all regularly funded organisations in each year divided by the population in that area in any year. Despite big funding cuts to Arts Council England’s core portfolio, its economic impact and collective buying power does not seem to have greatly diminished. While this is good news, further cuts in grants and a fall in reserves could leave individual organisations and the sector as a whole extremely vulnerable. GVA tells us about the net profit generated by the sector. Data is unavailable from 2007/08 so the base year is 2008/09. Due to inconsistencies in the data for England, in this edition of the Index we have replaced the figures for all years with the overall UK figures. In 2008/09, creative, arts & entertainment activities contributed 0.36% of the total GVA to the economy in the UK. By 2010/11 this had reduced to 0.32%. Since then it has grown reaching 0.44% in 2013/14. This equates to £4.4 billion per annum. The GVA figures are taken from the Annual Business Survey. The Standard Industrial Classification (SIC) Codes used in the Survey changed in 2007, so comparable data is only available from 2008/09. £4.4 billion contributed to the economy is a significant figure and it is great to see the creative sector playing a leading role in our economic recovery. More incentives like the Theatre Tax Relief will help keep this momentum going. In this edition of the Index we have changed the source of our data from the Office for National Statistics’ Annual Business Survey to the Office for National Statistics’ Labour Force Survey (LFS) and recalculated the Index for all previous years using LFS data. By using the LFS we get a better view of trends in self-employment. Across all industries in 2013/14, 14% of the labour force was classified as self-employed. The self-employed figure for those engaged in creative, arts and entertainment was 63% (up from 55% in 2008/09). In 2008/09, creative arts and entertainment activities accounted for 0.57% of the total UK labour force. This rose to 0.69% in 2013/14. Although this is survey data, it is via a very large survey (160,000 households per annum) and it does appear that there is a statistically significant increase in the proportion of the workforce engaging in these paid activities, particularly through self-employment. This indicator shows employment in the arts sector as a proportion of total UK employment. Data is unavailable from 2007/08 so the base year in 2008/09. The baseline was established using employment figures taken from the Office for National Statistics’ Labour Force Survey for the whole of the UK. Annual figures used for each year are those reported in March. Comparable data was only available from 2008/09. The growth in self-employment in creative arts suggests that a growing number of people see using their creative talents as the best way of making a living in these challenging times. This new labour force needs support, training and encouragement to deliver its potential. Survey conducted by the Office for National Statistics (ONS), collecting financial information, include turnover, purchases and approximate gross value added (GVA). The public bodies, funded by government, with responsibilities towards the funding, development and promotion of the arts. These comprise: Arts Council England (ACE), Arts Council Northern Ireland (ACNI), Arts Council of Wales (ACW) and Creative Scotland. An agency helping the arts sector to understand and develop audiences in London. Now part of The Audience Agency. 90 indicators used by central government to measure the performance of local government in the 2000s. Annual survey that focuses on levels of attendance and participation by children and young people in the arts in Wales. Money spent by a local authority less any income from external grants, sales to the public, etc. A national survey in England that collected the views of people on a range of issues concerning the place they live. It ceased in 2008. Sustain was an Arts Council England initiative. Funding was available for art organisations impacted by the recession. The fund is now closed. School-based survey conducted among 11-16 year-olds in Northern Ireland. How do we guard against volatile Lottery funding? Lottery funding is no longer icing, it’s cake. In order for the arts to hedge against historic volatility of lottery funding, is it right to have a fixed percentage of public spending (say 0.1%) made up of Lottery and Treasury funding, however constituted? How do we ensure access to the arts is not a postcode lottery? Should some kind of arts provision become statutory for local authorities? Perhaps there is a middle ground between completely discretionary and statutory? How do we ensure that the arts don’t continue to be cut disproportionately by local government? Should a local authority get more access to Lottery money for local government activities in its area if it matches that in funding for the arts and ensures all its citizens have access to high quality arts? There is a fundamental shift in the proportion of funding for the arts coming from national government, local government and the Lottery. How can this transition be managed to ensure that everyone in England still has access to great art? 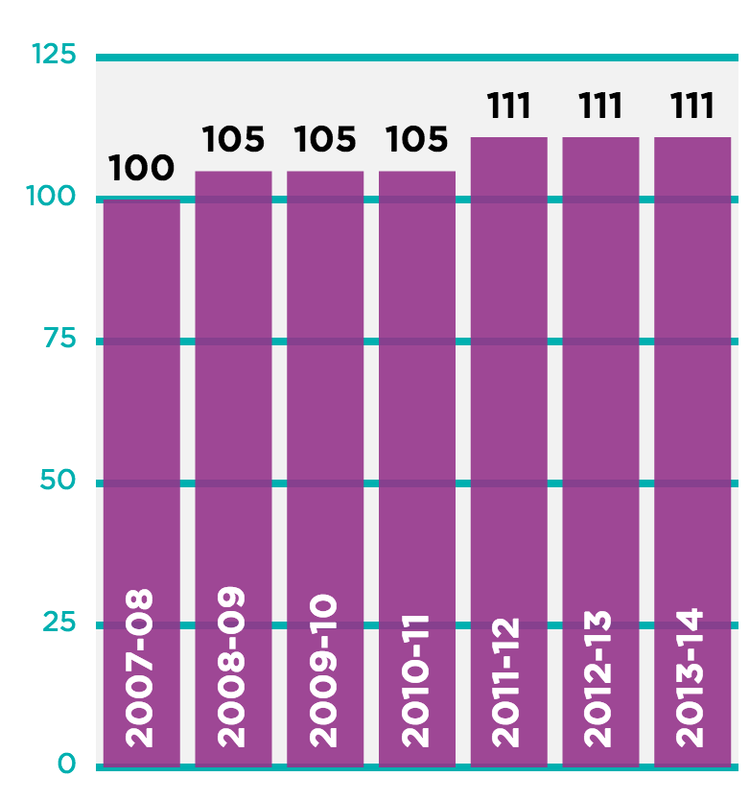 The Index is holding steady, but combined reserves of arts organisations are falling. Are we heading for a crisis when all the money prudently saved in better times is spent? This government has placed its focus on increasing business sponsorship and individual giving for the arts. Has this policy failed, or is it working? Without recent data, we can’t tell. Are trusts and foundations continuing to plug the gaps? We were seeing a greater dependency on arts funding from trusts and foundations when we published the last edition of the Index. Has this continued? Without recent data, we can’t tell. How do we maximise our economic impact? The contribution of the arts both to employment and the economy is growing. How do we build on this success? How will we keep our place as a world leader for creativity when the proportion of students choosing creative arts subjects at university is falling? The recent increases in tuition fees in England look to have had a disproportionate impact on arts subjects. How can we keep a track of local satisfaction when local government is no longer collecting and sharing data? Can we use national surveys like Taking Part to monitor trends in cities and rural areas around the country? This edition of the Arts Index shows that the arts are playing their part in feeding the economy and providing employment, while arts organisations are become increasingly entrepreneurial. The arts are no less popular, although audiences on average may be paying more. We can’t tell whether efforts to increase ‘private’ contributions to the arts from individuals or sponsors are providing sustainable income. While of course the NCA welcomes the significant increase in Lottery funding, this in no way replaces big cuts in Local Government support and the massive reduction to national Treasury funding. The arts continue to be one of this country’s success stories; they could play an even larger role in helping to unite communities and grow the economy. However, we worry we have now reached a tipping point where further cuts to funding will permanently damage how the sector supports society. If you share this concern, please email enquiries@50pforculture.org and the NCA will keep you informed as it develops its plans to support the arts and audiences over the next five years.